37th Edition : December 2016. Live slaughter prices continue to slip with the December indicator rate at Rp41,500 which converts to AUD$4.23 with the slightly weaker AUD. During December the majority of the balance of the 125,000 T3 permits were delivered into Indonesia to set up supplies for next year’s Ramadan. With additional imports scheduled early in the new year it will be interesting to see if these numbers will be adequate for demand during Ramadan and Lebaran. Numbers of slaughter-ready cattle in Indonesian feedlots are at a very low level. While I am unable to provide an accurate estimate of the current fat cattle population, it would be pretty safe to say that given there were zero imports for about 2.5 months while the permit dispute was in play, fat cattle numbers are likely to be at levels not seen for many years, probably in the 30 to 50,000 head or lower range. In the past, this situation would have led to a sharp spike in prices as butchers outbid each other to maintain their supplies. Now the opposite is the case. All feedlotters are experiencing weak demand with the reduction in prices still not able to get any serious numbers moving. Further price weakness is expected. To make matters worse, these remaining cattle have been on hand since T2 so the majority will be heavy-weights with high levels of fat leading to further discounting pressure from butchers. Abattoirs are reporting kill rates down by up to 50%. The only logical reason for this unprecedented supply and demand situation is that Indian buffalo beef has successfully captured a very large chunk of market share. 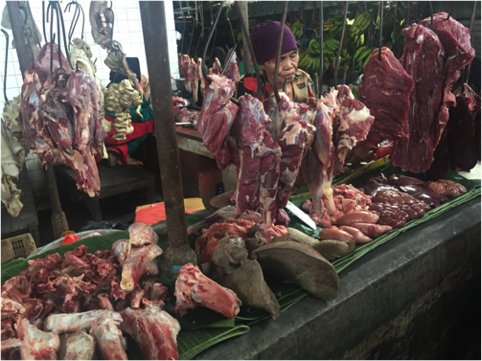 My agents have completed a broad survey in the central Jakarta market area and have concluded that while there is a modest quantity of buffalo beef in the wet markets, they suspect that it is not to a level that would be likely to produce the weakness in live cattle demand that we are seeing. Further investigations suggest that the majority of the frozen buffalo sales are being made direct from traders to end users, bypassing wet market stalls, which makes sense from a logistics point of view for frozen product. End users include small, medium and large local restaurants as well as bakso ball makers. Sales are also being made by door to door operators trading small volumes from cold boxes on the back of motor bikes. Significant buffalo sales have been reported in second tier cities of East and Central Java. My sources in Sumatera confirm that buffalo sales in all areas are strong and getting stronger here too. Unfortunately, there are no statistics available to prove this proposition but logic certainly seems to be leaning in this direction. It will take some time before we can obtain some reliable reporting of what volumes have been sold and to which customers before we can successfully answer the question. Regardless of the cause of the reduction in demand, the fact that sales are so weak while fat cattle supplies are low must set the bells ringing for live exporters, live importers and northern Australian producers. I don’t wish to be too alarmist but this is beginning to look like the affect seen in both Malaysia and the Philippines when they commenced imports of Indian beef in the 70’s and 90’s respectively. On the other hand, Vietnam is the largest importer of Indian beef in the world while the competition between Indian beef and fresh beef from Australian cattle in their domestic market is insignificant. Indonesians also have a strong desire for fresh product combined with large numbers of high income families so the impact for live exports is unlikely to be anything like the old Malaysian and Philippine experiences. A reduction in annual export sales for 2017 of about 50% is starting to sound more like a fair estimate. From nose to tail : One area that buffalo imports can’t compete is for fresh offals and bone-in products which are highly prized by Indonesian consumers. Liver, kidneys, brains, spleen, testicles, tongue, lung, ox tail, leg bones, whole feet, intestines, tripe, skin etc. can be found for sale in every wet market selling beef. The request this month by the Indonesian Minister of Trade to his Australian counterpart to reduce the price of live cattle exported from Australia (by $1 per kg) is an excellent example of the very different political systems in each country. The fact that the Indonesian Minister even asked such a question also highlights the lack of understanding of the way each other’s political and commercial systems work. While both countries operate systems based on parliamentary democracies, that is about where the similarities end. The Government of Indonesia (GOI) believes in big government driving the bus while Australia allows the market to get on with business while regulating as required. The interventions of the GOI in the beef industry seem modest when compared to their policy stance towards the mining industry. All large miners of primary products like coal, iron ore, bauxite, copper etc. are required by law to commence downstream processing of their products before exports are permitted. This has caused massive disruptions in the huge Indonesian mining sector with some companies complying, some stalling and some closing up shop. Government policy changed again only this week when parliament allowed some miners an additional 5 years before they needed to have their value adding infrastructure in place and operational. This was a body blow to those companies who had already complied. Welcome to Indonesia. Prices of fat cattle appear to be just beginning to rise in the north while southern rates remain stable. In the north, heavy bulls have sold to as high as D75,000 with steers up to D73,000. Southern rates remain at D68,000 for feedlot steers as long as they are not over-fat. Excessively fat animals continue to be severely discounted down to as low as D62,000. Butcher resistance is strongest for locally fed imported steers over 500kg. Heavy bulls in the south can sell for up to D72,000 with the highest price for leaner steers at D70,000. Imported Australian slaughter stock tend to have less fat than Australian cattle finished in feedlots so their rates are firmer. Supplies are supplemented by local cattle and Thai imports although prices for both of these tend to be much higher than the Aussie product. ESCAS issues leading to exporter restrictions continue to dominate the level of imports although the direct affect is still working its way through the supply chain. Local rates have lifted a fraction with prices of Baht107 FOB offered for selected cattle suitable for export to Vietnam while Bht105 is generally available for local sales. Otherwise the market remains steady with no significant movement in the retail sector. The severe flooding in the south east of Thailand may have some impact on beef prices but this won’t be known until next month at the earliest. With and FOB of $4.08 per kg for stock suitable for export to Vietnam and delivery charges including multiple border-crossing fees, the delivered price is still around 20 to 30 AUD cents higher than Aussie cattle landed in Ho Chi Minh. 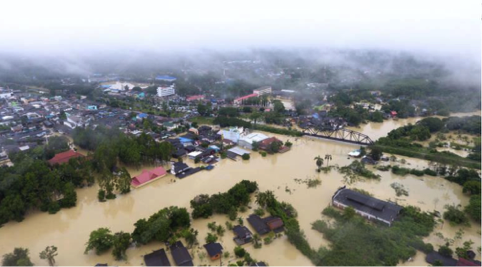 Photo : Recent flooding in south-eastern Thailand. No significant change and any of the market indicators except for a continuing trend for very minor monthly increases in the rates for Indian buffalo beef. My indicator price for buffalo is for frozen Indian knuckle and topside selling in the wet markets. Prices reported for end of 2016 as below. This increase may well be a function of the exchange rates between the Malaysian Ringgit and the Indian Rupee but will be interesting to follow in the coming months. Nothing significant to report apart from continued general optimism with good seasons, minimal natural disasters and firm markets for food and other items. The press has been reporting on at least two shipments of live slaughter cattle being prepared for delivery to China in the next few months. While these exports will represent the real opening of this very important trade, I suspect that they are likely to be more like symbolic gestures than the commencement of a regular trading business. Domestic prices of both live slaughter cattle and beef both remain relatively low. The northern China (Beijing area) slaughter price as reported by my agent is averaging about RMB22.5 per kg which converts to AUD$4.44 per kg live weight as noted above. This northern slaughter rate has consistently fallen (in AUD and RMB terms) since October 2015 as shown in the graph above and has only begun to stabilise at the current level since September 2016. If this price is a true indicator then considering the very high costs of buying good quality southern Australian slaughter cattle at the moment (not much change out of $4 per kg live weight) and the extremely high costs of the health and export protocols at both the Australian and Chinese ends of the supply chain, it seems like a very difficult task to be able to deliver these fat cattle into China and sell them at a rate that will achieve a positive margin. 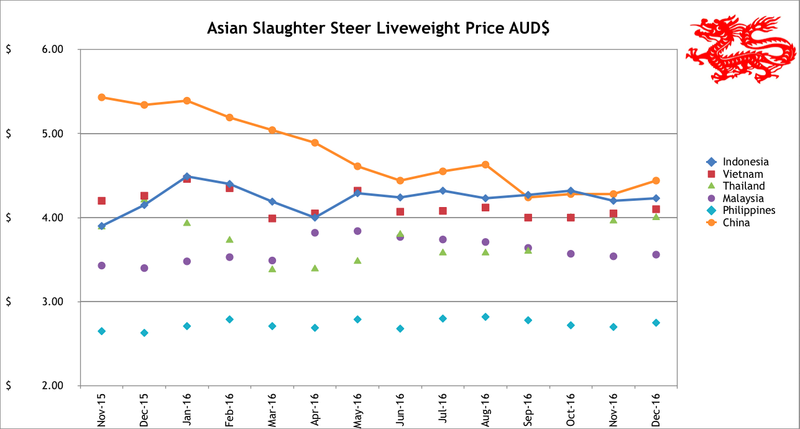 As a rule of thumb, the shipping costs of cattle from Australia to South East Asia total a very rough AUD$1 per kg. The cost to prepare, ship and quarantine slaughter cattle into China will almost certainly be at least as much if not quite a bit more. Even at AUD$1 to deliver to China, that means that the CIF price is likely to be in the AUD$5 per kg range, way over the current selling prices of around $4.50. The price from my Shanghai agent is even more depressing at RMB16.3 or AUD$3.21 per kg live weight. 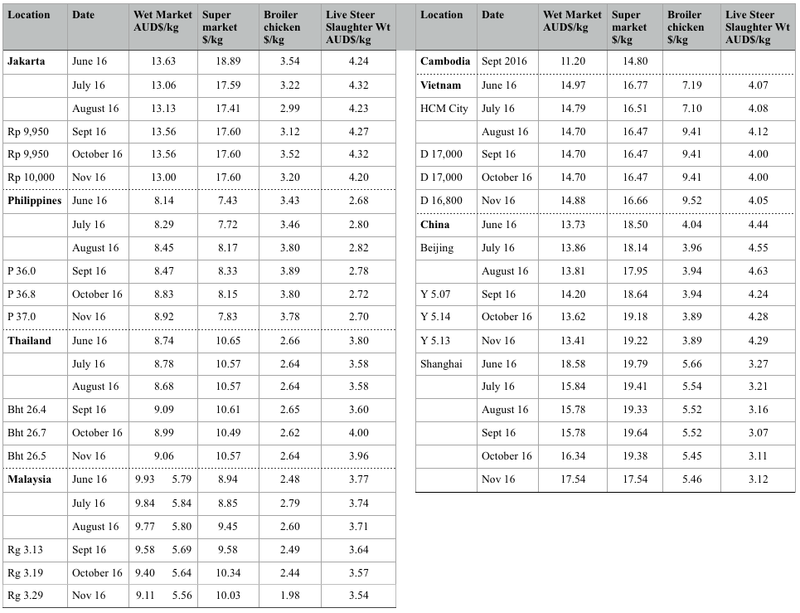 Both these RMB prices are admittedly “averages” with quality stock able to achieve higher rates. It is my understanding that the general depression in live prices is a result of the Chinese central government policy to remove support from smallholder beef enterprises in favour of large commercial producers. The same policy approach has also been in play for some time for the dairy industry with the figure above from Shanghai representing a rate for cull dairy cows. This is the reason why I only use the northern figure for my monthly indicator price. The logical outcome of this policy would be for prices to recover once the liquidation of the cull cattle held by both beef and dairy small holders comes to an end. Once this does occur, and I am not sure anyone knows when that might be, then the delivered price of Australian slaughter stock might look a lot more financially attractive and the business is likely to surge ahead. In addition to all this industry restructuring, large volumes of beef are now appearing in the market from South America with considerable discounting still in place to attract customers to try the new offering. And Indian buffalo continues to flow in the back door in massive tonnages. On the positive side, similar to the situation in Indonesia, locally slaughtered fresh meat represents a premium product for which the Chinese customers appear to be willing to pay and they are big fans of fresh offals, bones and other slaughter biproducts which are not available from India or South American suppliers. 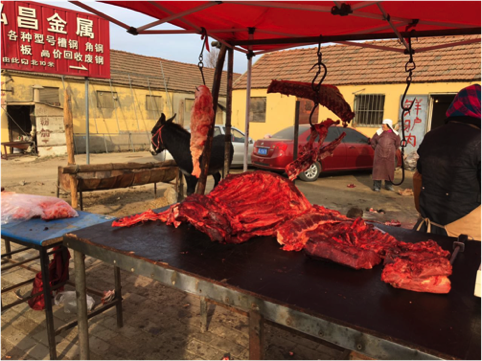 Lots of competition from non-cattle “beef” too – Donkey beef stall in northern China. Yes, I know, not normally a part of this report, but high quality red meat never the less. When I went home for Christmas to visit my Mum, she cooked me my favourite dish, which is rabbit casserole. I used to catch rabbits as a boy and reckon that my Mum’s rabbit dish is a world-beater. Since the various rabbit plagues have been released over the years to keep their numbers in check, supplies have dropped and prices have risen. What I was not aware of was how far! 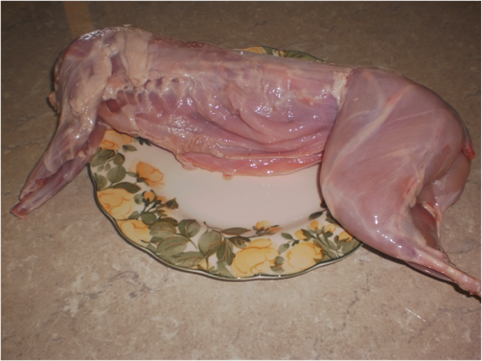 The farmed rabbit in the photo below cost Mum AUD$32 and weighed 1.5 kg or $21.30 per kg. I used to sell smaller wild rabbits in the local pub for 50 cents a pair! The casserole was magnificent and if it was up to me I would have happily paid a lot more for such a nostalgic treat. Farmed rabbit from Victoria @ about $21.30 per kg. Exquisite.